From the Wilkes-Barre (Penn.) Times, Dec. 8, 1905. Paid the Last Penalty of the Law After a Legal Fight of Two Years — Was Guilty of a Cruel and Diabolical Murder — Lured a Loving Husband to Destruction for the Sake of His Insurance and for the Love of Another. WINDSOR, Vt., Dec. 8. — Mary Mabel Rogers* was hanged by the neck until she was dead in the Windsor prison this afternoon for the murder of her husband, Marcus Rogers, in 1902. The woman was pronounced dead at 1:28 o’clock, just fourteen minutes after the trap was sprung. Without a trace of fear or a show of any emotion, Mrs. Rogers went to her death quietly and calmly, as she had told Mrs. Durkee she would last night. She made no statement or confession, when given an opportunity before the signal of death. She merely nodded her head, indicating that she was quite ready. She Spent a Sleeples[s] Night. Racked by her own contending emotions, Mary Rogers arose from her sleepless cot this morning to live [through the few wretched hours of her life and meet her death before the day is near done on the gallows in Windsor prison. Pallid from fear, which clutches at her heart at last, she left her cot and half reeled to the cell door, where she watched the first gray tints of morn creep through the barred window at the end of the corridor, and as the shadows fell more lightly on the whitened walls and the corridor began**] to fill with light the woman knew the final day had come. A half sob, a catch of breath that might have escaped from her and she turned and placed her hands in those of Matron Durkee, who had come to the cell early to be with her when roused from a troubled sleep. No tears filled her eyes. She had wept early in the night, but the truth of her hopeless end had come to her at last and burnt itself deep into her soul, leaving her but a poor miserable thing for the execution of the law. Long into the night she had prayed with Father Delaney, who had gone to her when she called. Then physical exhaustion, from the silent struggle in her being came and she fell into an uncertain sleep robbing her mercifully of the horrible thoughts of the violent end by the noose. The sun had fallen below the gray [†] and cheerless hills to the west last night and the departing shadows within the prison walls had fled to inky darkness when Mary Rogers, standing at the grated cell door watching the fading light die out for the last time in her life, turned to Mrs. Loukes, the guard, and began to sob. It was the first emotion she had shown since she bade her mother farewell last Saturday. Father Delaney was sent for, as Supt. Lovell feared there might be a sudden collapse. The priest came and went to the woman’s cell. Mary Rogers brushed the tears from her eyes and spoke a quiet greeting to Father Delaney. The good priest spoke kind words of comfort to her and she made a reply, but her words could not be heard as the woman had retired to a far corner of the cell. The priest and the woman sank to their knees and prayed. The usual night sounds in the prison corridors were hushed for the convicts knew it was Mary Rogers’ last night on earth. Mrs. Rogers grew calmer and Father Delaney left the cell and went to the guard room, where he was within call. The woman spoke to Mrs. Durkee, the prison matron of the coming day and told her that she was ready to meet her death. The Procession to the Scaffold. Shortly before 1 o’clock the guards went to Mrs. Rogers’ cell and dressed her for the execution. The woman wore the customary black dress and shirtwaist that was made for her first execution. She wore no corset or collar. With the six deputy sheriffs leading the death procession, she left her cell with Matron Durkee, who accompanied her down the three flights of stairs to the guard room. As Mrs. Rogers left the guard roo to walk down the short flight of steps leading to the enclosed court, she saw for the first time the instrument of her death. It was a walk of forty feet to the gallows’ steps. When the woman reached the gallows’ floor, a deputy tied her hands, the black cap and sack were drawn about her and the drop fell. Mrs. Durkee had dressed the woman in a combination black skirt and waist, which had been made for the execution last June. In the face of death, the vanity of the woman asserted itself and she called for a gold chain and locket, which she carefully put about her neck which was bare, the matron having previously removed the collar. She wore no corsets. The cell door creaked and Mrs. Rogers stepped out in the corridor and took her place between the deputy sheriffs. Mrs. Durkee walked by her side. Down the three long flights of steps the woman walked without a sign of fear or collapse. She reached the guard room and stepped across the ro[o]m and down into the enclosed court. Inside in one corner was the instrument of death, while ranged around the court were the prison officials and the State’s witnesses. Mrs. Rogers looked at the scaffold as she walked to the steps, but turned away and looked dully at the spectators. A deputy sheriff preceded her up the steps of the gallows and another walked by her side in case she should g[i]ve way. The courage of the woman was magnificent. She reached the scaffold floor without a falter, though the face showed the prison pallor usual in prisoners of long confinement. Deputy Sheriff Kiniry motioned Mrs. Rogers to a seat on the scaffold and the woman sat down and gazed about as if she was a spectator to an event in which she had no part. Deputy Sheriffs Thomas and McDermott quickly pinioned the woman’s arms behind her and then stepped aside. Deputy Sheriff Kiniry leaned down and asked Mrs. Rogers if she wished to make a statement. “No,” she said almost inaudibly, and accompanied her answer with a shake of the head. Deputy Sheriff Spofford ordered Mrs. Rogers to stand up and she walked over and stood on the trap. Then a large black sack was drawn over her body and tied at the neck, while Deputy Sheriff Spofford, after the black cap had been adjusted, slipped the noose around her neck. The deputy sheriffs stood back and Spofford gave the signal to Deputy Sheriff McCauley. There was an intense silence in the execution chamber. All of the spectators nearly fainted from the sight. No sound came from the black bag other than a half smothered gasp. Dr. Dean Richmond, the prison physician, stepped forward and placing his hand on the woman’s wrist felt for the pulse. The woman’s neck had not been broken by the fall for the pulse beat was still perceptable [sic]. The spectators stodd [sic] still and waited. It seemed an age to them, the fourteen minutes that the black thing hung there on the end of the rope. The doctor pronounced the woman dead at exactly 1:28 o’clock. The witnesses filed slowly back to the guard room and Mary Rogers had paid the penalty of her crime to the State with her life. Body Taken to Hoosic Falls. The body was cut down and prepared for bural [sic] by two undertakers from Hoosick Falls, N.Y., where her body will be buried in the family plot. The casket reached the prison an hour before the execution. She told the prison matron that she wanted to be buried in the clothes in which she had been hanged. History of Mrs. Rogers’ Crime. Every ingenious device known in law, was used to save Mary Rogers from the gibbet, and it was not until the case was disposed of by the Supreme court of the United States late last month that all hopes was given up [sic] of saving the woman’s life. Had there been one mitigating circumstance; had there been one spark of womanliness in Mary Rogers, had she shown slight possibilities of regeneration, Gov. C.J. Bell, of Vermont, might have interfered. The murder was as brutal as that of Mrs. Martha Place, who hacked her step-daughter to pieces because of jealousy, in Brooklyn. Gov. Roosevelt declined to interfere and save her from electrocution in March, 1899. Mrs. Rogers killed her husband, Marcus Rogers, in order that she might possess herself of $600, his life insurance, and marry another man. The murder was committed in Bennington, on Aug. 12, 1902, by the administration of chloroform. The circumstances leading up to the murder breathe of foul deceit, cunning and a viciousness inconceivable in a woman. Mary Rogers was deeply loved by her husband. Tiring of her life with this quiet, unpretentious man, she left him. In her unfortunate life that followed in Bennington she met a youth, barely 17 years old, by the name of Leon Perham, a half breed Indian, who became enamored of her. Perham wanted to marry her. Mrs. Rogers had no mind for that, but kept Perham dangling by her side. Mrs. Rogers fell in love with a well known citizen of Bennington, who, however, was not aware of her passion for him. As a woman of the street she knew she could not win him, and in her simple way bethought that once in possession of her husband’s $600 life insurance money she would become an object of devotion and attention. With the thought came the plan to do away with Rogers, whom she had left. Rogers, in spite of her life of shame, had oftentimes sent word to his wife to come to him and he would forgive and forget the past. His strong love for her and his willingness to forgive were his undoing. She entered into a conspiracy with Perham, who was her willing tool, being led to believe that she would marry him. Rogers was a powerful man and his end had to be accomplished by cunning and deceit. She wrote that she was ready to come back; wanted to come back and would he forgive her. Leon Perham turned State’s evidence and on the stand he gave testimony, a recital such as has rarely been heard in the courts of law. 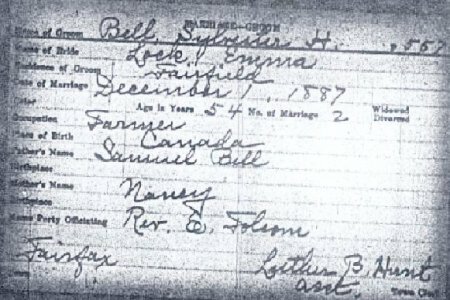 According to Perham, Mrs. Rogers had written to her husband, from whom she was estranged, asking him to meet her at 9:30 at night. After the meeting and pretended reconciliation Leon led the way into Morgan’s grove, and by a winding path to the river. A great stone wall separated the grove from the river bank. The distance from the wall to the bank was less than half a dozen feet. “May and I walked along with Rogers until we came to a break in the wall,” said Leon. “She went through and we followed. It was cold and I had on a big overcoat. I spread this out on the ground and all three of us sat down. We were only a few feet from the edge of the river. “May said she had a new trick with a rope. “He laughed. May laughed, too, and dew out a piece of clothes-line. Then she said she’d bet she could tie me so that I couldn’t get loose. “‘I’ll bet you can’t,’ I said. “She tied my hands loosely and I broke away. She tried it again and I broke away again. “‘Try it on him,’ I said. “‘I’ll bet you can’t tie me,’ said Rogers. “He was as strong as an ox. May tied him and tried to tie him tight, but he just gave a heave and broke away. She tried it a second time, and he broke loose without any trouble. She was getting worried. She tried it a third time, and when he broke loose again I saw that she couldn’t tie him. “‘Let me do it,’ I told her. “He thought it was fun and knelt down. I tied his hands behind him and he struggled, but could not get loose. His back was towards May. “I gave her a signal and she drew the vial of chloroform and the handkerchief from her bosom. She poured a few drops on her handkerchief — not very much — and put her arms around his neck. Suddenly she drew his head back in her lap. The move threw him on his hands, which were behind him, so he was doubly helpless. Then she put the handkerchief to his nose. He sputtered. Suddenly she emptied the vial on the handkerchief, completely saturating it. He began to struggle. “‘Jump on his legs,’ she said. “I jumped on his legs to hold him. May had him gripped around the neck and pressed the handkerchief against his nose. His struggles were terrible. He threw me off as if I had been a kitten. He got one hand free and used it to help himself. “But May clung to him and never once did the handkerchief get away from his nose. She had the grip of a tiger. He struggled and flung himself and her on the ground, and every time I came near him a heave of his legs or his free arm would throw me off. The body was rolled into the river. A note was left, purporting to have been written by Rogers, that he had drowned himself. Mrs. Rogers’ unseemly haste in her efforts to collect the life insurance and other damning circumstances led to her arrest and indictment. Perham confessed and was sent to Windsor prison for life. 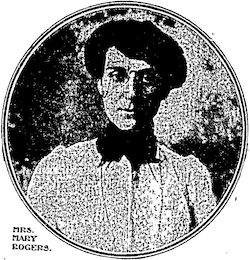 Mrs. Rogers was found guilty on Dec. 22, 1903, and she was sentenced to be hanged on the first Friday in last February. She was thrice reprieved by Governor Bell, the second reprieve expiring last June, when counsel for the woman made an appeal to the United States Federal court to have certain legal questions reviewed by the Supreme court at Washington. The third reprieve expired to-day. Mary Rogers was 22 years old and little more than 19 when she killed her husband. * She’s not even the most famous Mary Rogers of homicide: that distinction goes to a murder victim of that name from earlier in the 19th century … whose never-solved death inspired the Edgar Allan Poe short story “The Mystery of Marie Roget”. † Errant placement position in the published article of the bracketed text as noted in the footnote above. On or about this day in 1629, one John Dean, described in court documents as “an infant between eight and nine years,” was hanged in Abingdon, England for setting fire to two barns in the nearby town of Windsor. According to Historia placitorum corone: The history of the pleas of the crown, Volume 1 by William Axton Stokes and Edward Ingersoll, this juvenile felon was indicted, arraigned and found guilty all on the same day, February 23, “and was hanged accordingly.” The actual date of his execution is not known, but it can’t have been long afterward. The wheels of British justice ground very quickly in those days, though not so fine. The age of criminal responsibility in England at the time was seven years old. (It was later raised to eight, and in 1963 to ten, where it remains; there have been calls to raise it again.) Accordingly, anyone seven years or older could be charged with a crime and face the same penalties as someone seventeen or forty-seven — including the death sentence. The same source notes that little John Dean was probably the youngest child ever executed in England. For reasons lost to history, he was not given the usual commutation: although there is no mention that anyone was hurt or killed in the fires, the judge found that John had “malice, revenge, craft and cunning,” and refused to recommend a reprieve. Perhaps the boy had a prior criminal record. Thus did John Dean secure a footnote in history; were it not for his death no one would remember him today. Somehow, I doubt he would have thought it was worth it.